We at GrrrGraphics convey our best wishes to Marine Le Pen in the French election. The so-called ‘centrist’ Macron represents the globalist bankers and submission to Islam. LePen represents traditional France. We need more nationalists such as Le Pen, Geert Wilders, and Nigel Farage in Europe to help stem the onrushing Islamic tide as well as end the tyranny that is the European Union. We need politicians who aren’t cowed by political correctness. Americans elected a populist president to drain the swamp and make America great again. France can do something similar by electing Le Pen. Make Great Britain great again. 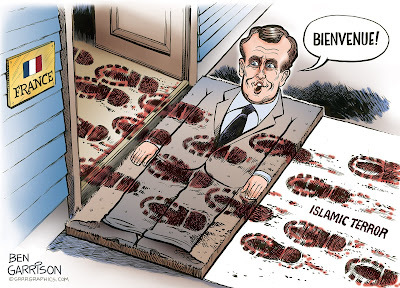 Make France great again. Protect Europe against the Islamic invasion and start standing up for western civilization again.